Giving it up for Lent - Really, What Were We Thinking? Tweet It's almost time for Lent. This will be my third Lent whilst blogging. The first year, I got philosophical about how Lent is a time for reflection and preparation since I was about to have a baby. Last year, I gave up Facebook & BabyCenter to focus (pretty successfully, in my opinion) on this blog. This year? This year, I'm just going to be completely vain. I'm not kidding. I'm giving up bread, rolls, & chips. I love bread. The last time I gave up bread, I lost weight quickly and, quite honestly, I would like to lose some weight. I've already been to the doctor(s) and I do have some minor common (& not so common) things going on that are affecting my energy level. I'm in the process of taking care of those issues and I hope by dumping some of the fairly empty carbs I love to consume, I'll be able to kick start some weight loss. I weigh about 5 pounds more than I weighed the day I gave birth to Klaw. I'm about 30 pounds heavier than I was when I got pregnant. I don't even care to lose all 30 pounds. I just want to have fewer creases in my flabulous belly. It would be easy to assume that I'm completely missing the point of Lent. Giving up bread, rolls, & chips will be a huge sacrifice and I promise you, I will think on Christ's most holy sacrifice as my mouth waters and my stomach grumbles while I eat a salad at Panera Bread or nuggets at Chick-fil-a. Hopefully, after 40 weeks, I will be a better, slightly trimmer person. 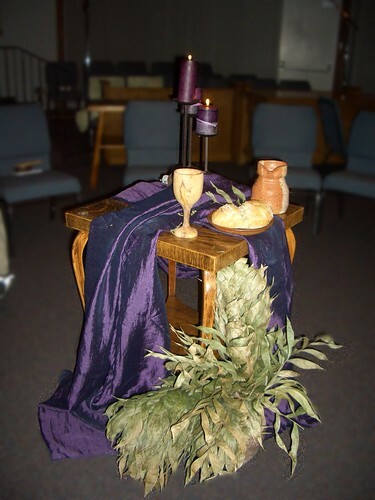 Do you celebrate Lent or any other annual period of sacrifice & reflection? What would be the hardest thing to give up? What would improve your life the most if you could give it up?